As it stands, Rob Gronkowski and Julian Edelman are clearly Tom Brady's two favorite targets and it's not even close. This is going to be a recurring thing until something changes. On Wednesday, Patriots quarterback Tom Brady was asked about the relationship (read: trust) he has with his receivers, most of whom have been non-factors during the first two weeks of the season. As it stands, Rob Gronkowski and Julian Edelman are clearly Brady's two favorite targets and it's not even close. "I think that’s definitely a big part of what we’re trying to do offensively to make us hard to defend is to be able to throw the ball to everybody. 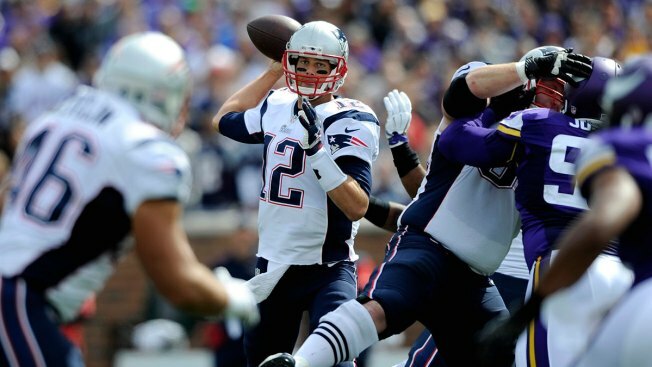 And you’re right, those guys have seen a majority of throws, and I’ve got to do a better job finding the other guys because it’s a lot of good routes, they’re big targets, guys are working really hard to get open," Brady said Wednesday, via ESPN.com. "So hopefully it shows up this week in our pass game. We’re going to work hard this week to see if we can all be on the same page more often." The Patriots face the Raiders, a team that can be the cure to any ill. Still, if New England is going to have long-term success offensively, that means names like Danny Amendola, Kenbrell Thompkins, Brandon LaFell and Aaron Dobson also need to get involved. "I don’t think our passing game has been really stellar to this point, so it’s hard to sustain much over the course of the game and get those guys the ball when we’re not doing as good a job as we’re capable of," Brady continued, before adding: We’ve got to keep going after it, and guys get more opportunities to get balls, and I need to do a better job finding those guys when they’re open and running the routes that we talk about all week. That’ll go a long way to help us win."